Late that afternoon, the followers came to Jesus and said, "No people live in this place. And it is already late. Send the people away so they can go to the towns and buy food for themselves." Jesus answered, "The people don't need to go away. You give them some food to eat." 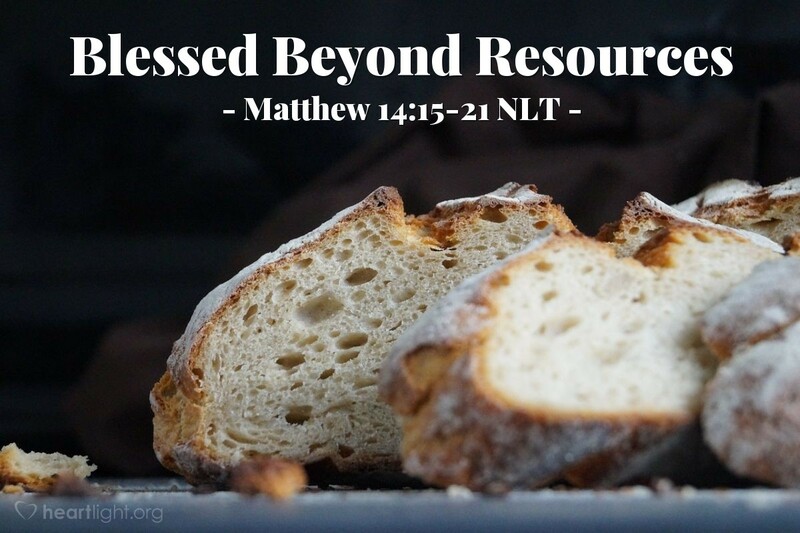 The followers answered, "But we have only five loaves of bread and two fish." Jesus said, "Bring the bread and the fish to me." Then Jesus told the people to sit down on the grass. Jesus took the five loaves of bread and the two fish. Jesus looked into the sky and thanked God for the food. Then Jesus divided the loaves of bread. Jesus gave the bread to the followers, and the followers gave the bread to the people. All the people ate and were filled. After the people finished eating, the followers filled twelve baskets with the pieces of food that were not eaten. There were about 5,000 men there that ate. There were also women and children that ate. Don't you just love it that the disciples who didn't think they could do anything to feed the whole crowd each got to pick up a basket full of pieces that were left over! Jesus has a way of using, teaching, and rebuking us all at the same time when we don't have faith that what needs to be done can be done with his blessing. What doors of opportunity is the Lord opening for you to minister through right now? Are you afraid you don't have the resources? Remember, Jesus' power is great when the glory goes to God, ministry is for others, we pool our resources, we offer what we have to him, and we are motivated out of compassion! Loving and gracious Father, give me courage and faith to believe you can bless my meager resources when I bring them to you. Forgive me for being so timid when you long to use me to minister for your glory. In the mighty name of Jesus I pray. Amen.